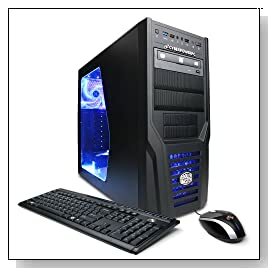 The CyberpowerPC Gamer Ultra GUA880 is a high performance gaming desktop that is able to handle all your daily computing stuff with a low price. So while it is a decent system for heavy gamers, is also great for those that want to do things quickly and smoothly- a multi-functional machine. 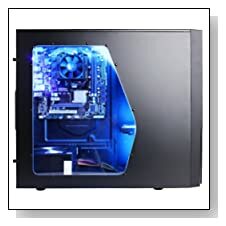 Cyberpower PC has the quad core powerful AMD FX-4300 Vishera (4MB L2 Cache) at 3.8GHz speed that goes up to a massive 4.0GHz, very fast 8 GB DDR3 SDRAM memory to efficiently multitask and run intensive apps easily and 2 memory slots for expansion up to a max of 16 GB, 1TB at 7200rpm spindle speed SATA III 6.0Gb/s interface hard drive and 64-bit version of Windows 7 Home Premium. The processing power of AMD FX-4300 is quite suitable for all the system intensive heavy tasks..
And it is accompanied by NVIDIA GEFORCE GT 610 1GB - PCI Express x 16 discreet graphics card for the superior graphics performance when you're watching movies, playing games or editing photos. Hard drive storage space is quite generous so that you can save all your multimedia and common files and the rotating speed is more than 50% higher than regular HDD speeds, at 7200 rpm. The system is capable of working on dual monitors so you have more screen space. You have a good variety of connectivity options, such as 7 x USB 2.0 ports (4 at the back and 3 at the front), 24x DVD±RW Dual-Layer Super-Multi Drive to read and burn DVDs and CDs, a gaming keyboard and mouse to ensure you'll be able to play at your absolute best (1 x PS/2 keyboard port, 1 x PS/2 mouse port), Integrated 10/100/1000 Gigabit Ethernet with RJ-45 port, 3 x audio jacks (Line In/Line Out/Microphone), DVI port, HDMI port, VGA port, Integrated - 10/100/1000 Ethernet. The GUA880 also looks nice and classy with its sleek black and blue mid tower gaming chassis. It weighs 32 lbs and has the dimensions of 19.6 x 7.5 x 16.8 inches, a gaming keyboard and mouse are included in the package. It has a power supply of 500 watts and comes with a 1 year parts and labor warranty. Conclusion: CyperPower Gamer Ultra is a good looking, powerful, super fast, relatively quiet and versatile desktop PC with a good range of connectivity options. Interestingly it doesn't have a wireless adapter but it doesn't cost much at all and you may order it with your purchase of this computer, as you'll soon find out it is already a very good value gaming and multimedia PC with high specs that is not to be missed and great looks with also blue LED light that gives your room a nice ambiance in the dark. The graphics card is more than adequate for high end games to be played at mid to higher settings but again there is always better and you may upgrade it later on if you need to. Highly recommended at its current price!